Are you sure your patient has hyphema? What are the typical findings for this disease? Patients have a history of ocular trauma. Older patients may complain of blurred vision. Figure 1). A supine patient may have the blood layer over the pupil and lens. If the entire anterior chamber is filled with blood it may be red or black. A black hyphema is called a blackball or eightball hyphema (Figure 2). Layered hyphema. 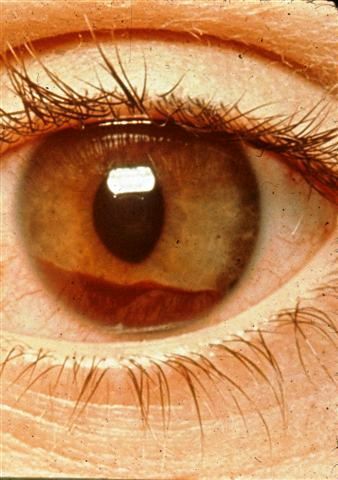 Note the subtle distortion of the pupil as it is pulled toward the clot. Total “blackball” hyphema. There are no visable anterior segment structures because the anterior chamber is filled with a blood clot. Nonaccidental trauma (child abuse) must be a consideration in any child with ocular injuries not consistent with the history provided. Bleeding diatheses from leukemia, blood dyscrasias, and clotting disorders as well as juvenile xanthogranuloma and retinoblastoma can produce spontaneous hyphema in childhood. Other causes include iris neovascularization, previous intraocular surgery, and herpes simplex and herpes zoster iridocyclitis.Note: Retinoblastoma must always be ruled out in a child with nontraumatic bleeding. This may require ultrasonography or selective evaluation with computed tomography (CT) or magnetic resonance imaging if hyphema blocks the view into posterior segments of the eye. Blunt trauma to the globe is the principal cause of hyphema. Compression of the globe with expansion/flattening in the equatorial zone causes tearing of anterior chamber vessels. Surgery for cataracts or glaucoma can cause spontaneous hemorrhage with hyphema formation. There are a number of nontraumatic conditions that cause spontaneous hyphema. Juvenile xanthogranuloma, retinoblastoma, leukemia, blood dyscrasias and coagulopathies, neovascularization of the iris, ciliary body melanoma, herpes simplex, zoster iridocyclitis, and iris microaneurysm are the major considerations. Hyphema is a clinical diagnosis. Patients with possible sickle cell disease (African American and Mediterranean patients in particular) need to be screened for sickle cell disease or trait. Ultrasonographic biomicroscopy or CT of the orbits and brain may be indicated when there is a poor view of the intraocular contents with possible disruption of the globe or possibility of an intraocular foreign body or orbital fractures. Once the diagnosis of hyphema is confirmed, the mechanism of injury as well as the physical examination will assist in determining whether there are serious associated injuries to the globe, orbit, and surrounding tissues (Figure 3). Protection of the eye from further injury during the examination or during ancillary testing, such as CT, must be a priority. A metal or plastic shield, not an eye patch, must protect the eye at all times. Hyphema with corneal laceration. The laceration extends from the 11 o’clock position across the superior pupillary axis with a shallow anterior chamber. Activity should be limited to bed rest with bathroom privileges. This is permissible as home care in compliant patients. Noncompliant patients, younger children, and those in whom abuse is suspected, as well as patients with severe associated injuries or significant intraocular concerns should be hospitalized. The head of the bed should be elevated approximately 30 degrees. Nonsteroidal antiinflammatory drugs and aspirin products may not be used. Acetaminophen or mild analgesic agents should be used. Longer acting dilating compounds such as atropine 1% or scopolamine 0.25% should be used. The topical steroid, prednisolone 1%, is used with caution. Children have a risk of cataract formation or intraocular pressure elevation from steroid treatment. Elevated intraocular pressure may require specific therapy. This should be performed by an ophthalmologist. Patients should be evaluated daily for at least 3 days and possibly 5-7 days depending on the condition. Rebleeding is a potentially serious complication that is most likely to occur between 2 and 5 days after the initial injury. The rebleeding rate has varied according to different studies. The consensus appears to be that this incidence is less than 5%. In patients in whom rebleeding occurs, approximately 50% will experience glaucoma and vision-threatening complications. Patients with hyphema should be reevaluated approximately 1 month after the injury for a complete anterior and posterior segment evaluation. Consideration for a yearly examination is reasonable because hyphema injury results in a theoretical lifelong risk for glaucoma. Antifibrinolytic agents to reduce the incidence of rebleeding have been used with efficacy.There have been significant side effects, such as nausea, postural hypotension, and vomiting, which strongly suggests that patients using these agents should be hospitalized. This therapy is less frequently used because of these considerations. A topical aminocaproic acid is under development. This shoud have fewer systemic considerations such as nausea and hypotension, but further research is needed before it can be released as a treatment modality for hyphema. What are the possible outcomes of hyphema? Hyphema is a potentially vision-threatening condition. Any size hyphema can bleed again. The goal is to prevent rebleeding, control the intraocular pressure, and recognize associated conditions such as significant injury to the iris, cataract, and retina. Children are at risk for amblyopia and must be closely monitored as the hyphema resolves. Amblyopia therapy must be quickly instituted when discovered. Traumatic hyphema can be associated with injury to any structure of the eye from lid to the optic nerve. Most traumatic hyphemas resolve without loss of vision or development of glaucoma.The rate for rebleeding is approximately 5%, with increased intraocular pressure developing in approximately 50% of these patients. Steroid drop therapy can also elevate the pressure. The pressure increase can produce corneal blood staining and optic atrophy, with permanent loss of vision. Amblyopia is an additional concern in children. Temporary occlusion of the visual axis from blood, corneal edema, or even the protective shield can produce amblyopia. Protection from avoidable injury would significantly reduce the rate of hyphema occurrence. Eye protection for work and play is necessary for both children and adults. Controversies regarding hyphema management have resulted in discussions regarding optimal therapy. Topical steroid and/or (versus) oral steroid application is one consideration. Antifibrinolytic agents have been less widely accepted because of the nausea, hypotension, and vomiting complications from them. This frequently necessitates antiemetic therapy and consideration of hospitalization in patients who might otherwise be managed successfully as outpatients. Hospitalization with sedation and bilateral patching was advocated at one time for pediatric patients. Generally speaking, hospitalization is rarely indicated except for the most noncompliant patients/undependable families, or severely injured children.